In the file browser, locate and select the sound file that you want to add to your project, then click on Open. In the Target Audio Track panel, select New Audio Track if you want to create a new audio track and import the sound file in it, or Current Audio Track if you want to import the sound file into the selected audio track. In the Target Frame section, select whether you want the sound clip to be added to the First Frame of the audio track or to the Current Frame, where the timeline cursor is. 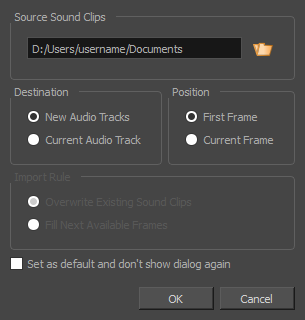 Overwrite Existing Sound Clips: If there are existing sound clips where the imported clips are supposed to be added, the existing clips will be overwritten. Fill Next Available Frames: If there are existing sound clips where the new clips are supposed to be added, the clips will be trimmed just before the existing clips. Select the Set as default and don’t show dialogue again option if you want to use the same settings next time you need to import a sound file.